If you borrowed waders, they have a hole in them. If you lent waders, they will come back with a hole in them. If you are hunting with the wind in your face, turn around. Look for mallards on sunny days in the middle of the morning. If it is raining, go home. Break ice in large sheets and slide the sheets under existing ice to create open water. If you want a good retriever, spend time with him every day. Decoys look like decoys if there is no wind to move them. Create movement in your spread. Be aware of impending wind shifts. Set up to hunt both of the predicted winds and you won’t have to move your blocks. Waterfowl are in range when you can see their eyes or their feet. The only thing that will get your feet warm is ducks over your spread. Ducks don’t get decoy shy. They get hunter shy. Do not separate from your hunting buddies to hunt a spread of decoys and cover more area. It is not safe and is harder to hide. Wait until summer to go swimming. It is too cold now. Pay attention to the weather, the ducks do. Dabbling ducks decoy better on sunny days, because there are shadows which hide hunters better. Do not set up straight down wind of another group of hunters. It will ruin their hunt and it is not healthy to aggravate people with shotguns. A blind is more important than your second bag of decoys. When hunting shallow water, walk through the decoys occasionally to muddy the water. On north wind sunny days, set up to hunt a cross wind to avoid looking into the sun. When hunting with others set up a safe zone of fire and shoot only when ducks are in that zone. Shooting at passing waterfowl is not hunting, it is shooting. 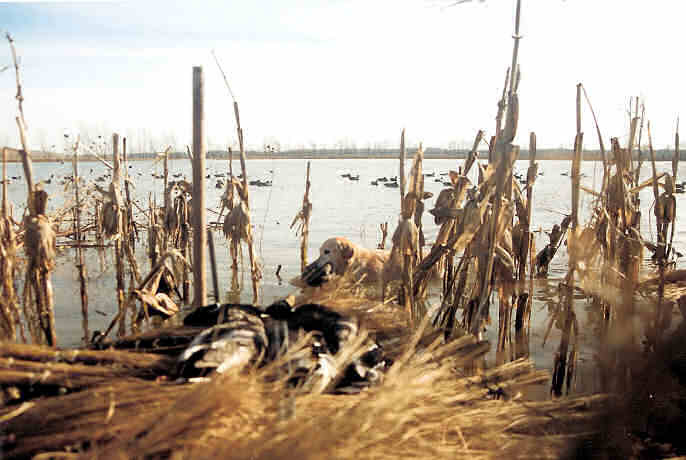 Decoying waterfowl into your spread and shooting ducks within 35 yards is hunting. If you can’t use a duck call, don’t. If it appears that you have missed a duck you’re shooting at, watch it until it is out of sight. It still may fall. Retrieve birds immediately to avoid unnecessary loss. On days with little wind, place decoys where they will catch the slightest breeze. Keep your ducks separate from other hunters’ and leave a head or wing attached until you get home. It is the law. A well mannered dog is the first step towards a good retriever. If ducks are flaring from your spread, shoot the novice hunter, he is probably looking at them. Don’t shoot the egg layers. Calling is overrated. You’ll do more to increase your success by learning the habits of the birds. If you can’t identify it, don’t shoot it. If you’re not sure of the water depth, send your buddy first. If you place more emphasis on the duck hunting experience and less on killing a limit, you’ll enjoy yourself more often. The best hunters are the ones that decoy birds the closest. Holding the geese out in front of you at arms length when taking the post-hunt photos, makes the geese look bigger. The best place for most hunters’ calls is in their pocket. The sound of acorns hitting the water is better than any duck call made. You got to have wind to decoy ducks. Windy days make poor duck callers better, but still days make poor duck callers worse. Call softer on still days and let novice callers practice on windy days when the ducks are upwind. Shallow marshes can have deep drainage ditches and potholes. Use caution around water without vegetation.